Last week, a new lunch group was launched in the Middle School. Seventh and eighth grade girls were invited to participate in a “Girl Power Friendship Group” over the course of eight weeks. During lunch, Middle School girls are coming together to learn about how to navigate difficult emotions, confidently communicate with others, and build strong friendships. The new group, under the guidance of Ashley Cooper, Middle and Upper School counselor, and Aria Fiat, Ph.D. candidate from the University of Minnesota, is a proactive way to address the social, emotional, and mental health challenges that appear developmentally in adolescent girls. Just last week in my head’s message, I reiterated a vision of MPA that reframes the understanding of “whole-child for whole-life.” Such an education is collaborative, experiential, and interdisciplinary, which values the assessments of broader aims—those skills, dispositions, and mindsets most necessary to live, learn, and thrive in today’s 21st century globalized society. A crucial aspect of which is the social, emotional, and mental health of our students. Attending to the social, emotional, and mental health of our students does not mean that we take away time and emphasis from math, English, or science. It means that we understand that students cannot succeed academically if their energy and focus is directed at managing anxiety, living with depression, or distracted by social problems. Over the last several years, we have increased our programs, services, and staffing to enhance our ability to support the well-being of students. 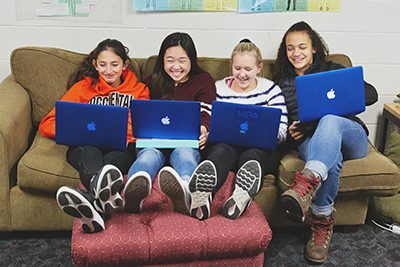 Like the Middle School Girl Power Friendship Group, new initiatives are emerging at MPA that are intentionally occurring throughout the school day and we are enhancing many existing programs and services to truly attend to the whole child. One existing practice is for adult teams to meet on a regular basis to monitor and assess the academic, social, emotional, and mental health of students in order to proactively address concerns in real time. Teachers, administrators, and professional staff look holistically at students who are struggling and address those problems in a manner specific to each individual. In a developmentally appropriate way, students are engaged, partnerships with parents are formed, and when needed, the culture of the school or division is augmented. Another example of looking holistically at the needs of our students is the new wellness class required in the Upper School. The eleventh grade class was created to programmatically address some important topics in a thoughtful way and to promote overall health for students. Our own data gave us the clarity that junior year has many stressors and that students would directly benefit from both the revisiting of health topics from ninth grade, as well as, the introduction of topics that are relevant to their young adult lives. The class is taught in the fall term and each junior has the course for a full quarter of time. Some of the very important themes in the course center on healthy decision making, mindfulness practices, communication, and the role of consent in relationships. A parent sent me a link last week to a recent column by New York Times columnist David Brooks about the importance of relationships in education, the effect it has on academic success, and the critical importance of social emotional learning. It is a fascinating read and speaks directly to a differentiating and unique strength of MPA—the relationships students form with their teachers. It affirms our belief that when teachers are able to create positive relational experiences in the classroom, where they convey optimism, encouragement, and when they genuinely believe in students’ abilities, students feel accepted and understood. This in turn significantly impacts academic performance. I do think, for a variety of reasons, that the there is more urgency to attend to the social, emotional, and mental health of young people but as a parent, and as head of school, I sleep well knowing that a “whole-child for whole-life” education is not new to MPA. It is written in our DNA.